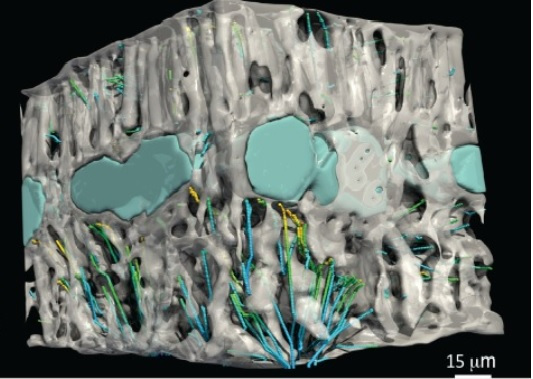 In a recent study, Australian scientists used 3D imaging to reproduce the inner reality of the leaf, including the dynamic carbon and water exchange processes. “The leaf is an amazingly complex landscape, where water and gases flow in many directions depending on variables such as temperature, light quality and wind. 3D images give you an understanding of what is really happening,” says Professor John Evans from ANU. The images are created from biological specimens, by integrating 2D leaf measurements to create 3D volumes and surfaces. The experts say there is huge potential to embrace 3D complexity to improve understanding of leaves at multiple levels of biological organisation, including harnessing the knowledge to improve the photosynthetic performance of crops. “It is a bit like being able to walk inside the leaf, instead of looking at it squashed in two dimensions,” said Sydney University’s Professor Margaret Barbour.